Detector is closed in small metal box with dimensions 30 x 45 x 22 mm. It is AD8310 based. AD8310 is logaritmic detector with linear output and dynamic range 90 dB. Schematics is according data sheet. Input connector is panel SMA. 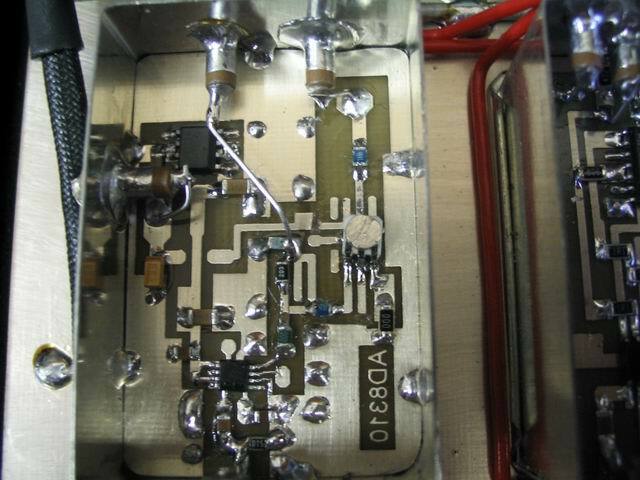 +12V power, outputs DIGI OUT and OUT A/D go via condensers 1 nF. 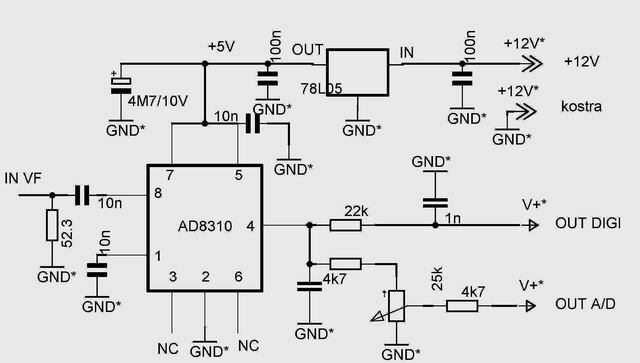 OUT A/D is connected to A/D converter input instead of original diode detector. Output level is adjustable using 25k trimmer. Output OUT DIGI goes to front panel where digital (high input resistance) voltneter can be connected. It allows to measure detector input power level in dBm according table. PCB is double sided, grounds are connected, dimensions are 45 x 30 mm. It is suggested to proceed this way: connect grounds, solder passive components, then SMD 78L05, connect temporary +12V and verify +5V output. Then add AD8310, put everything into box, handle wiring. 100k zeroing resistors are replaced by 20k. Level potentiometer has 4k7 resistor added. Measurement is using linear mode of wobler program. Dynamic range of the detector is 90 dB!